Please note: We rent only FULL WEEKS in the summer months, no weekends or shorter stays. ALL WEEKS begin on Sunday, NO EXCEPTIONS. You may check in later, if you rent the whole week that starts and ends on Sunday. Nestled in a quiet owner-occupied neighborhood west of the by-pass, our cottage rests only a few blocks from the sound. Nags Head offers waves galore, surf fishing, nature walks, golf, lighthouse climbing, countless art galleries plus craft and souvenier shopping! 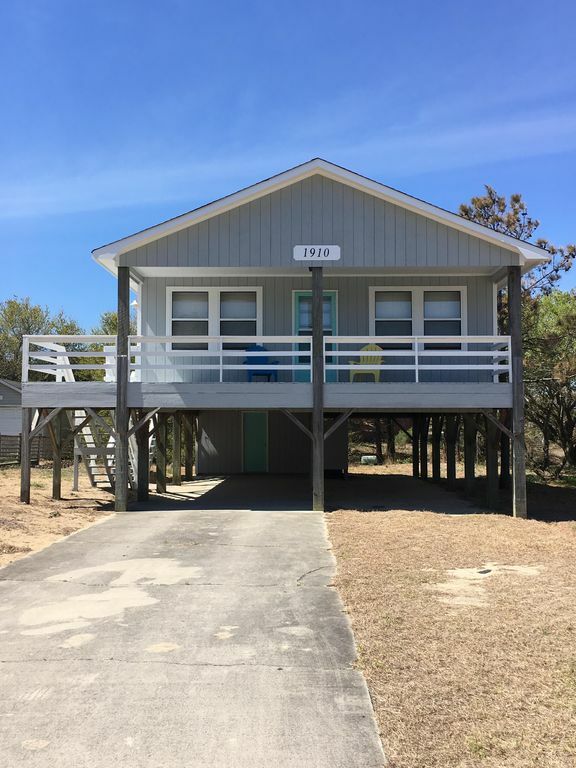 The cottage covers one floor, on pilings - the open and bright, vaulted great room includes a living area, dining area, and fully-equipped kitchen with microwave and dishwasher. An over-sized eat-at bar provides extra room for eating or rainy-day beach activities if you have kids. WIFI (which has just been up-graded for those who want to still be connected ;) DVD player, and central air and ceiling fans make for an enjoyable vacation. Greet the sunrise or relax with friends for a drink at the end of the day on our large covered porch. There's paved, covered space below for two cars and paved open space for three more. Please use the outdoor shower to get the sunscreen off at the end of a lazy beach day. No Smoking and No Pets -- we expect you to honor the quiet nature of the neighborhood, and have a requirement of two years full time employment. Sorry, but that means no students unless they are with their adult family. No 'party groups'. There's PLENTY to discover at Nags Head! Come visit - you'll definitely come back! Oh, yeah -- I left out the EXCELLENT North Carolina State Aquarium and the outdoor drama 'The Lost Colony' and the Wright Brothers memorial museum -- all a short drive away. Jockey's Ridge is the largest sand dune in the east -- you can hang glide off it! Cape Hatteras is home to the most famous of all lighthouses, with several other lighthouses scattered along the coast to tour as well. There's great pier, surf, or charter fishing and crabbing nearby and outlet malls for an entirely different 'fishing' expedition! 2. Click on the calendar to see if the week you want is available. 3. Click on the e-mail link to instantly send us your request. You must include a phone number. We'll quickly return our rental agreement by return e-mail. 4. Sign it and send your deposit and you are done! Want more personal service? Call (free call if you have Verizon IN). Leave a message if we don't answer. We'd love to speak with you and answer any questions you might have. Thanks for visiting our site at VRBO, we hope you enjoy sunny Nags Head! About Brenda Carner Property mgr. We've loved the Outer Banks for YEARS, I hope you enjoy it! We had visited the Outer Banks for years, and wanted our kids to be able to enjoy it. We've had many, many fun family times at the cottage. Enjoying the porch -- whether just sitting and feeling the breeze, or playing cards or lively games with the kids and their friends. View more about Brenda Carner Property mgr. We really enjoyed out stay here. It was out first visit to the outer banks area. House was nice and very clean. Suggestions for improvement would be a better approach, yard overgrown with weeds. Beds could use better mattresses and most of the screens in windows had holes in them. Wanted to open windows but didn't because of screens. Brenda very easy to talk to, sweet personality. It was exactly as stated! Love the washer and dryer right there inside so we could keep up with laundry! House was clean beds comfy. I would recommend this house to anyone! Easy to find centrally located right in the middle of everything! We really enjoyed our stay. Brenda was very prompt to answer our questions and welcoming. The house is cozy, comfortable, and well maintained. The carpet is good quality and in good condition, although my preference would have another type of flooring. Few blocks to the beach. Convenient parking at the beach, great location close to Food Lion and Harris Teeter, and Wall Mart few miles away. Close to the Jockey’s Ridge National Park, Wright Brothers Museum and mini golf corses. I would definitely come back! Loved the house, had a great trip. Close to everything and alot of the sights. We had a great stay at this cottage. The location is central to everything. It was clean and just the right amount of room for all of us. I will definitely rent again. The only thing I may recommend would be some new mattresses sometime in the near future. Thank you for a wonderful week! We enjoyed our stay at the cottage. Great location for us. We were not looking for anything on the beach since we went during spring break. We were fine driving to the beach, and that was an easy drive. Not a lot of supplies in the kitchen, and the beds are not updated. Could definitely use newer better mattresses. Also living room furniture was old and uncomfortable. It was a great price, super clean, and easy to book. Hang gliding from the top of Jockey's Ridge! Rates are subject to change until confirmed. When using the "Book It" button, please CALL at (804) 920-90459 to let me know you have submitted a request, as the system will automatically DECLINE your request if I do not affirm it within 24 hours. Before Memorial day or After Labor day week, minimum stay is 2 nights at $175 per night.